So from the news today, we lost Ralph Branca today at the young age of 90. Ralph certainly did not have anything resembling a Hall of Fame career, only going 88-68 and appearing in 3 All Star games. But we all know how he is linked forever to Bobby Thomson. The good thing about the ordeal of being labeled the goat is how Ralph took it in stride and it didn't affect his life. You think about others that were on the losing end of bad plays and how they were forever branded with their mistake, like Mickey Owen, Fred Merkle, Bill Buckner, Donnie Moore and others. Many came to terms with their low point, while others did not. Even after allegations that the Giants were stealing signs, Branca said "...even if Bobby knew what was coming, he had to hit it ... Knowing the pitch doesn't always help." For those unfamiliar, we call people who say things like that "pure class". I picked this up last Feburary and have yet to show it off. Today seems like the right time. I am sure the smudge on the "c" in Branca turned a lot of people off from buying it, so I was able to get it for about $6.50 with shipping. But $4 of that was shipping. Ebay gougers. Hard, though, to pass on a nice one card autograph as this. I just need a Thomson to complete the grouping. Interestingly, there's video of Ralph Branca as a contestant on the Concentration game show from 1963. He's not even there as a celebrity contestant, just a regular player. And, since these are from their Champions tourney, he must have been really good at it. Branca is a fantastic example for today's young athletes (and really people in general) in learning how to deal with defeat. He truly never let that "shot" get the best of him, at least he never seemed to. Cool card. Glad you showed it today. 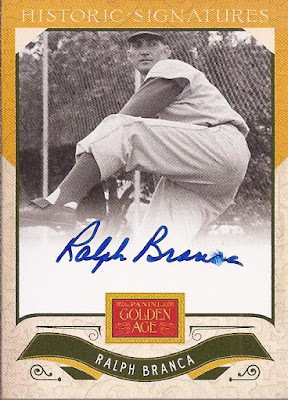 I watched Ralph Branca sign at a card show many years ago in New Jersey. He seemed to be a super friendly guy. This was back before promoters charged for 'photo ops'. He stood and posed for everyone who came through the line who asked. I regret not getting something signed that day if only to have had a chance to say hello. Shot Heard 'round the World was a few years before my time... but as a baseball fan the call is embedded in my brain. I picked up a Steiner photograph with Branca and Thomson's signatures. The fact that he signed a photo of that piece of baseball history is another example of him being a class act.